Acton High’s Y11 students have achieved some very creditable results this year, with 64% of eligible students achieving 5 A*-C grades. This is a testament to the hard work of staff and students during what was a very challenging year, which saw the early retirement through ill-health of the headteacher, Mandy Golding. The 5 A*-C grades with English and Maths figure of 38% does represent a fall from the school’s best ever performance in 2010, but the long-term improvement trend has continued. We congratulate all Y11 students who have reached their personal targets this year, and are delighted that several students have achieved truly exceptional results: these include Nandita Shah, (pic below) who gained 8 A* and A grades and Jamshid Barry, who gained 7 A* and A grades. We are also very pleased with the performance of many of our Y10 students, all of whom have taken several GCSE exams this year. A large number of these have already secured 5 A*-C grades including English and Maths, and many students have gained at least one A* or A grade. These students have created an exceptionally strong base on which to build next year. We also had a large number of Y9 students achieving good grades in English GCSE this year, including one A*and a number of As. 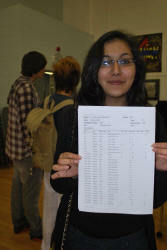 Zara Siddique in Y9 even managed to add a B grade in Photography AS to her B in English GCSE. 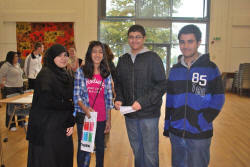 Such results create a great deal of optimism about the future performance of students at Acton High.